Major concerns about the deficiencies and risks of Oroville Dam’s auxiliary spillway and flood control operations were raised by American Rivers, the California Sportfishing Protection Alliance, Friends of the River (FOR), the Sierra Club, the South Yuba River Citizen’s League (SYRCL) and Sutter County during FERC relicensing of Oroville, 12 years before the crisis began at Oroville Dam when a giant hole developed in the spillway on February 7. 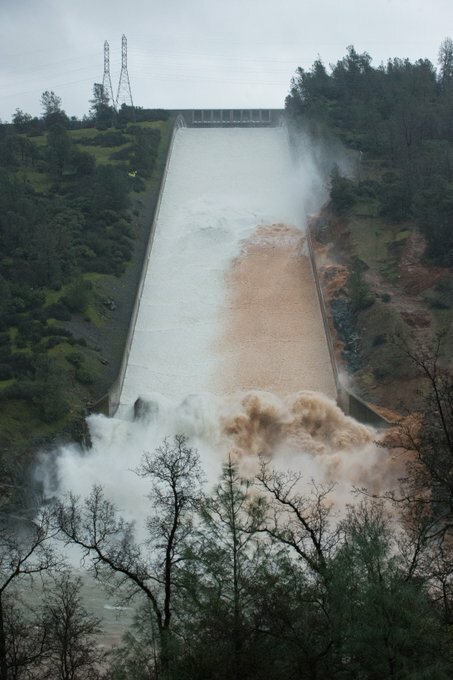 Water flows over Oroville Dam auxiliary spillway on February 12. The issues have not been resolved. In 2005, Friends of the River, the Sierra Club, and the South Yuba River Citizen’s League filed a motion to intervene on the behalf of members that live or reside behind the levees on the Feather River. This briefing is based on that filing. 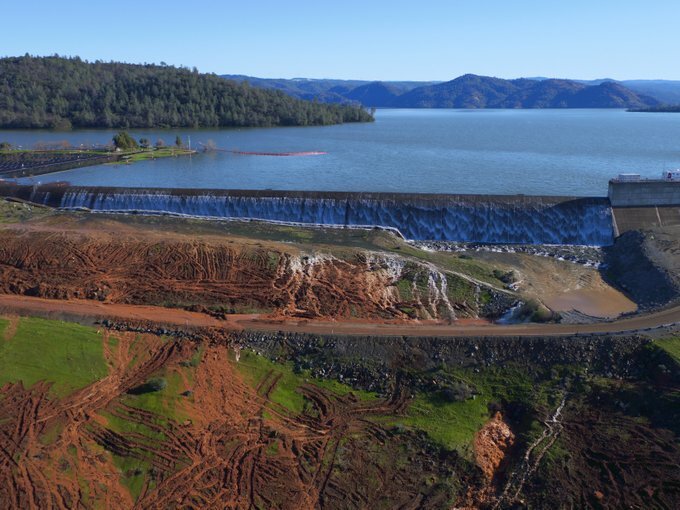 Oroville Dm includes two spillways, the main spillway (controlled by gates) and an ungated, unarmored auxiliary spillway, consisting of a 1,730 ft long spillway lip at an elevation of 901 feet, which spills directly onto the hillside. prescribes “objective” releases of a total of 150,000 cfs through both spillways. The cause of the Oroville Dam crisis was the rupture in the dam’s primary spillway. To protect the levees downstream, the Army Corps allows no more than 150,000 cfs to be released from Oroville, and mandates that Feather River flows not exceed 300,000 cfs below the mouth of Yuba River. But if inflows are so large that the reservoir reaches 911 feet – 10 feet above the auxiliary spillway – the Emergency Spillway Release Diagram is followed, prescribing even greater releases to protect the dam. DWR’s response to concerns: In response, the Department of Water Resources denied there was a risk of loss of crest control if the emergency spillway was used, but did not provide any geotechnical information to verify the claim. DWR also argued that a feasibility study of armoring the emergency spillway should be financed as a flood control project by the Army Corps of Engineers. DWR has not requested a feasibility study by the Corps for armoring the spillway, and the project is unlikely to be eligible for funding as an Army Corps of Engineers flood control project because DWR has the obligation of controlling releases from the dam. Ron Stork, Senior Policy Analyst at Friends of the River, contributed to this summary.